This is the first part in a little series about the typical roles the players of Find the Path fulfill during gaming sessions. Today’s focus is keeping track of the party’s experience. I know that some groups have everyone track separately, or the GM just decides when to have the players level up, but here at FtP we like to keep it family style. We also don’t play unless we can all play, so there isn’t a need for keeping track independently. Before you can start tracking experience for your home game, you’re going to need to know if your group is on the slow, medium, or fast experience track. In our games, we usually run on the fast track. In other games, however, this might be different so keep that in mind. Once you know your track, you need something to use as a ledger. I like to use an old-fashioned spiral to keep track of experience, but you could do this digitally, too. Pro-tip: if you are currently playing in more than one game and have to track multiple games’ experience, pick up a 3 or 5 section spiral. It keeps everything organized and easy to find. I set up my pages to have four columns like so.. The first column is where I write the name of a monster, the type of trap, or the situation that caused the party to gain experience. Sometimes, if I can’t remember the name of the monster or adversary, I’ll just write something vaguely descriptive and call it a day. The reason you want to keep track of this is so that if the GM asks if they’ve given you experience for an encounter, you have a record. This can make sure you get as much experience as you should and nothing is overlooked. 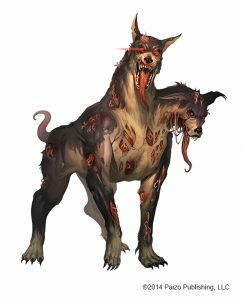 Remember the death dog? He might be “worm dog” or “bad puppy” in the experience tracker. Next up is the Challenge Rating column, CR for short. I write the CR for the enemy faced and if there were multiples. For example, if we fought three goblins, I will write 3 X the CR. This isn’t necessary, but I like to track CRs so that as the game progresses, I can get the hang of how much experience each CR gives the party. 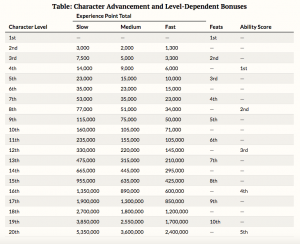 Column three is the XP for individual encounters. This is pretty self-explanatory, but I put the total experience earned for the obstacle here. Sometimes this requires multiplication, so beware. Your GM might say something like “You have defeated 3 challenge ratings of 1, 100 experience points each” which means you have to multiply 3 by 100 to get the total XP for that encounter. The final column is the total. This is where I add this encounter’s earned experience to the total earned so far. It’s important to let the party know when we’ve leveled up as soon as it happens, so I jot down the XP needed to level up at the top. I use pencil, so this can be easily erased and changed as we advance. And that’s it. You are now a master experience tracker. Go forth and adventure, Pathfinders! Great, simple method. I’m a fan of the digital route and setting up multiple worksheets within the same workbook to track XP across all campaigns, but nothing beats the trusty pen and paper! Thanks! We’re happy to share the methods to our madness. Hopefully we can help people who aren’t as experienced or who just aren’t quite sure what to do with experience.